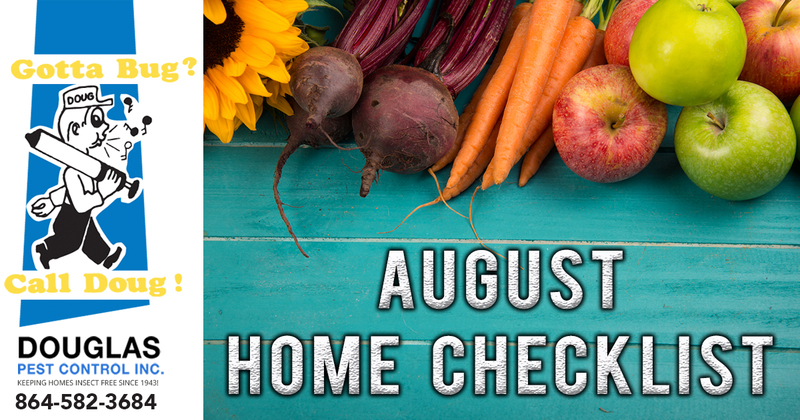 August is here and just like that so is your August Checklist! August can be a stressful time getting the kids back to school and unwinding from all summertime activities. Here are some things to check off the list that will only take an hour or less. August is a great time to be proactive when it comes to insects and unwanted pests. Remove standing water and secure places that insects can hide. Contact your Spartanburg exterminator to schedule your personalized treatment plan. Do you have any outdoor projects that you haven’t completed? Finish projects that you have started with the remaining summer days in August. With the long summer days in the rearview mirror take some time to clean and store any beach or pool toys so they are out of the way until you need them again. Setting up your kid’s backpacks can be really fun. Take the time to make sure everything is where it needs to be to make the school year run smoothly. When transitioning from summer to fall clothing you will find that organizing your closets and drawers can be rewarding. Setting up your closet with the clothes that you will wear most to work or school will cut down on time you need to get dressed in the morning. You may also find that you save money on clothing but not purchasing items that you already have that could be hidden in your closet. With schedules getting busier setting up a family calendar is a simple way to stay on top of everything including the kid’s tests and class projects. Photos are a blessing and organizing them can be a headache. Take a little at a time and back them up to your computer or organize them chronologically. Cooking dinner can be stressful but only if you make it that way. Take the time to clear out the pantry and refrigerator so you know what you have to work with. Be sure to toss expired or unwanted food keeping only foods you will enjoy. With summer crops coming to an end if you have too much produce pack up a basket and give some homegrown goodness to a neighbor or friend. Your emergency kit always needs to be ready because you never know when you will need it. Check your kit and make sure food and medications has expired.